Pianist Read Gainsford was recently described in the press as the possessor of “finger-numbing virtuosity and delicately chiseled precision” yet he is driven to pursue connections beyond the merely pianistic. Known for his insightful introductions from the stage, reaching beyond the footlights to be what a magazine profile described as “Pianist of the People” he pursues audience connections wherever he can find them. From collaborating with noted oceanographers in presenting “Voice of the Whale” by George Crumb, to consulting with art historians and living artists to create a series of images to accompany his performances of Messiaen’s Vingt regards sur l’Enfant-Jésus; from historical reenactments of the famous piano duel between Franz Liszt and Sigismond Thalberg of 1837, to playing Stravinsky’s Rite of Spring for live performance by a noted dance troupe, he is committed to reaching audiences in ways beyond the traditional. Born in New Zealand, Gainsford studied at the University of Auckland under Janetta MacStay and Bryan Sayer where he received a grant from the Woolf Fisher Trust and the top prize in the Television New Zealand Young Musician of the Year. He then relocated to London where he worked at the Guildhall School of Music and Drama as a pupil of the renowned pedagogue Joan Havill. Later he moved to the USA, earning a doctorate at Indiana University under Professor Karen Shaw. He has performed widely in the USA, Europe, Australia, New Zealand and South Africa as solo recitalist, concerto soloist and chamber musician. He has made successful solo debuts in Carnegie Hall’s Weill Recital Hall and London’s Wigmore Hall, as well as performances in the Kennedy Center, St Martin-in-the-Fields, Queen Elizabeth Hall, and others. Gainsford returns regularly to his home country of New Zealand to perform, teach, and visit family. Keen to work with other musicians, his latest collaborative project involves forming Trio Solis, a group dedicated to connecting with people beyond those who traditionally form audiences for classical music, and who made their Carnegie Hall debut in May 2009. In addition to traditional concerts and residencies, they enjoy "Building Bridges" - collaborating with talented student musicians to share their experience of making music with younger players. Gainsford has been associated for many years with the unique chamber music center Garth Newel, and has played with many leading musicians including the Audubon and Serafin Quartets, Richard Stoltzman, Jacques Zoon, Luis Rossi, Yuri Mazurkevich, Michelle LaCourse, Denis Brott, Carmen Balthrop and Jerrold Pope. In 2004 Gainsford was involved in founding the highly successful Light in Winter festival, whose purpose is to celebrate the intersection between art, nature and science. Dedicated to the works of living composers, Gainsford was a member of Ensemble X, a contemporary music group in Ithaca, NY. He recently gave the world premiere of the 3rd Piano Concerto by Ladislav Kubik, which he also recorded with the National Philharmonic Orchestra of Brno under the baton of Alex Jimenez, and recorded Ellen Taafe Zwilich's Images for two pianos and orchestra for Naxos. He also gave the world premiere performance and recording of Marc Satterwhite's Five Rivers of Hades in February 2011. He has worked with many other composers including Steven Stucky, Chen Yi, John Psathas, Christopher Theofanidis, James Matheson, Steven Burke, Robert Paterson, Mark Wingate, Karim Al-Zand, Diego Vega. 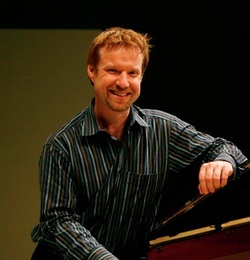 Formerly on the faculty at Ithaca College where he received the college-wide Excellence in Teaching Award in 2004, Dr. Gainsford is currently Professor of Piano and Coordinator of Keyboard at Florida State University. He is highly in demand as a masterclass clinician and teacher, having recently appeared at the Chautauqua Institution, Bennington Chamber Music Conference, and multiple collegiate piano workshops. Long fascinated by the use of the body in making music, he has studied the Alexander Technique, Feldenkrais Method and yoga, as well as anatomy and physiology. His presentations have included As We Are Designed: use of the body in playing the piano and Music and Faith, as well as many lecture recitals on music ranging across the scope of piano repertoire.